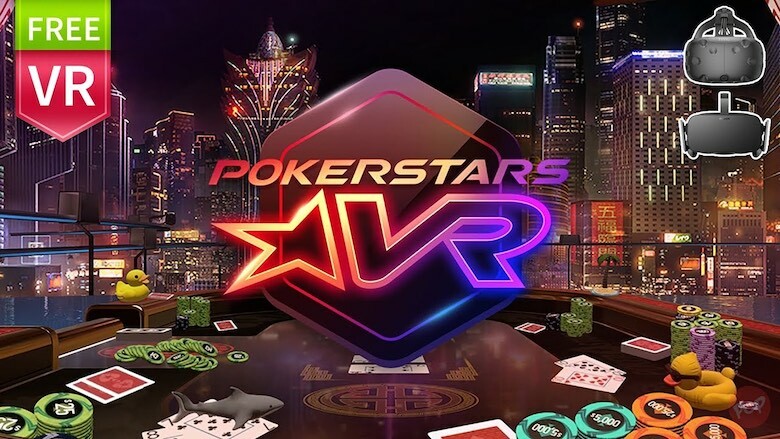 PokerStars VR Review *UPDATED* 2019: Too Good to Be True? So, you like poker and you’ve probably played online poker, but you haven’t played this before. PokerStars VR stands out. Poker games are a dime a dozen on the web. To find one that stands out and does something different is special. If you haven’t played it, you’re missing out. It’s not just that it’s virtual reality. PokerStars VR is the next level in online poker. It offers a quality poker game combined with the social interaction to make it a more realistic and more fun poker game. If you want to have a great poker game and have the time of your life doing it, you have got to try PokerStars Virtual Reality. The folks at PokerStars have done an excellent job of integrating movement details which allow you to truly observe and interact with the other players. However, there are a few things to consider before jumping in. Do you have the right tech? PokerStars Virtual Reality game is currently only available for HTC Vive and Oculus Rift, and you need hand controllers with sensors to play. Also, you need a pretty good PC to handle the software. It requires 8 GB of RAM and a 64-bit processor and operating system with either an Intel i5-4590 or AMD Ryzen 5 1500x chip, though they recommend an Intel i7 or greater. For graphics, you’ll need an NVIDIA GTX 1060 or AMD Radeon RX 480, and they recommend a GTX 1070 or greater. Yes, this is just a game and, for right now, it’s free to play with no real money being gambled. However, caution is always recommended if you have a tendency towards a gambling addiction and the developers have indicated they may introduce a way to play with real money if there is a demand. Now, that we have that covered, let’s take a look at the game. PokerStars Virtual Reality is an online multiplayer virtual reality poker game. It is built off of the popular PokerStars online game. You will be playing Texas Hold’em. The poker gameplay is fine, though that’s hard to get wrong at this point. Where PokerStars VR really shines is in the socialization and the fine detail of the motion tracking. You are playing with other real players, not computer avatars. You can talk to each other and interact. Using your touch controllers and sensors you can interact with the objects in the game much as you would in real life. Your body movements and particularly the movement of your hands are tracked very well, giving people the ability to read your tells (and for you to read theirs) as you play. This, alone, takes the poker gameplay to a whole new level of realism. 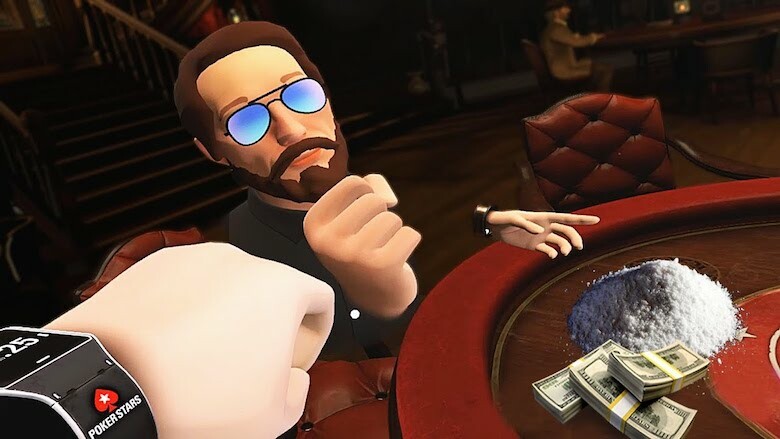 PokerStars VR also gives you the ability to choose your avatar, dress them, and get props and other objects, like drinks, cigars, piles of cash, and more. This adds to the social fun as you give your neighbor a cigar and light it for them or you toss money in the air as you win. Currently in Early Access on Steam and is free to play. It will be free to play after full release as well. There are several features which cause PokerStars VR to stand out in the world of online poker. The poker gameplay follows the rules of Texas Hold’em and allows players to interact with the game appropriately. Bet, call, fold, check your cards, and watch the dealer deal out the cards just like you would in a casino. If you’ve ever played poker (or any other card game) against a computer, you know there are times when your opponents just don’t act like a real person. That takes some of the fun out of the game. 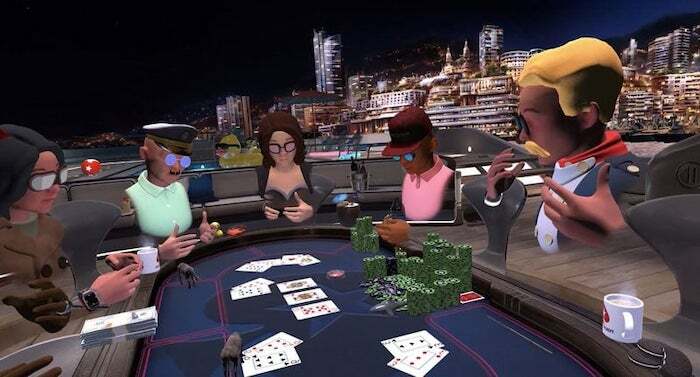 In PokerStars Virtual Reality game, you are playing against real people. Real people fold under pressure. Real people react to cards. Real people can be erratic and unpredictable. That makes the game more fun. 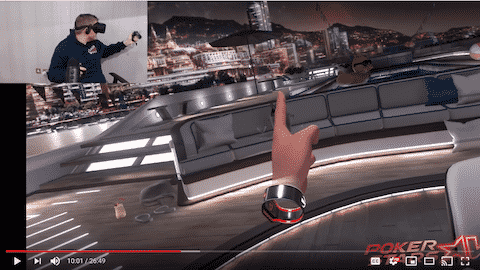 Pokerstars Virtual Reality gives you the ability to interact with those real people in a variety of fun, sometimes realistic, ways, beyond just the actual poker game. First, you can live chat with people. You can comment on plays, taunt, and have real conversations. Second, you can get props and objects, some realistic and some not so realistic. Buy your neighbor a beer or light their cigar. Buy some balloons when you win or set off fireworks. You can even fire off a gun. This can lead to some fun outside the poker game, itself, like when someone orders a box of rubber ducks and everyone at the table takes turns trying to toss them in a nearby pool. These kinds of games and interactions can be quite enjoyable, though some more serious poker players may find it distracting and annoying. I’m sure, however, that the more serious players can find tables with other serious players. Along with objects you can get, you can also design your avatar. You can select the appearance of your avatar and even dress them up with whatever costumes and props you want to have some fun and express yourself. When you have a good hand, do you check your cards frequently? Do you shift around in your seat when you are bluffing? These are just some of the tells people have and which come through very well in PokerStars VR due to their meticulous attention to motion tracking. In poker, you play the people as much or more than the cards you are dealt. With online poker, you lose the ability to read people because you can’t see them or watch their movements. However, in VR, you can read the people more, making it more realistic to real-life poker. This also adds the ability to have more interaction with the other players. Hand them a drink, give them a thumbs up, or give a fist-bump. Motion tracking allows you to do all this and more. In the real world, you move your hand to see your cards. You toss or push chips into the pot. You have to put down your drink to pick up your cigar. When you lose these types of physical interactions, it makes the experience less real. The immersive environment and real-world physics created in Pokerstars VR give you that sense of realism as you play. Where would you like to play poker? There are five environments to create the mood you want when you play. Choose from Macau 2050, Macau Suite, The Showdown Saloon, The Monte-Carlo Yacht, and The Void. These environments allow you to play in the future, the Old-West past, on the high seas, in a luxurious locale, or in a distraction-free plain location. If you enjoy playing poker with your friends, but you find that getting together is too difficult, private tables may be your solution. 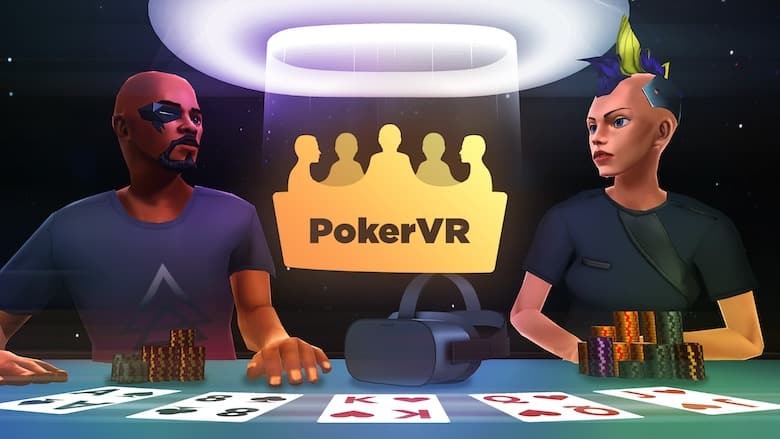 Rather than only being able to play against random strangers, PokerStars VR has a private table feature where you can set up a table to play with your friends. If you want to play poker in real life, you usually have to drop some cash, though hopefully, you’ll win it back an more. PokerStars VR is free to play. The money you bet with is free and the objects you “purchase” are also free, both from accounts that regenerate over time. The developers may eventually add the ability to bet with real money and may add premium purchase options, like purchasing new locations or costumes or refilling your accounts more quickly, but right now, it’s all free. What Are People Saying About PokerStars VR? Since PokerStars VR is still in Early Access on Steam, I looked through the Steam reviews to see what people were saying about the game. For the most part, the reviews and comments I found were very positive. People seem to enjoy the social interactions, particularly with the use of props and the fun conversations they have. People have also commented that the experience is very smooth. PokerStars VR is an excellent online virtual reality poker experience. It provides an immersive environment with a light-hearted, fun atmosphere. However, if PokerStars VR doesn’t quite fit what you are looking for, here are a few alternatives you may want to check out. Lucky Night Texas Hold’em is very similar in gameplay to PokerStars. The poker gameplay is, of course, the same as it’s the same game, but they also use touch controllers and motion tracking to allow you to read your opponents better. Where PokerStars and Lucky Night start to differ is with the extras. Lucky Nights is more of a straight-forward poker game where PokerStars has the props and atmosphere that promotes a more light-hearted, fun experience. Lucky Night Texas Hold’em is free to play, like PokerStars, and has in-app purchase options. 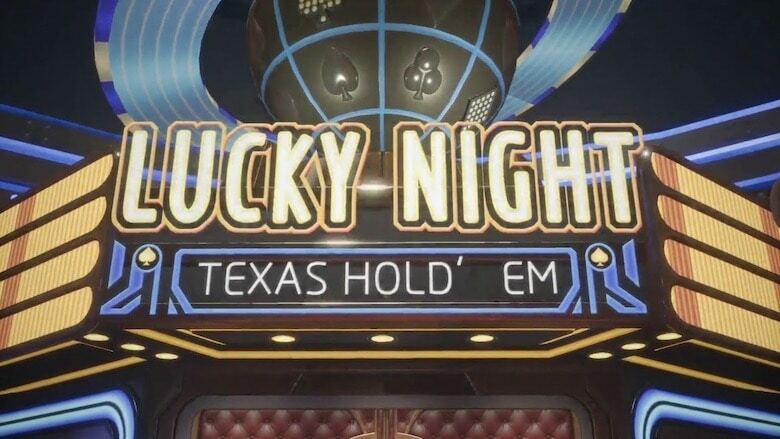 If you prefer to play poker without the fun extras, Lucky Night Texas Hold’em is probably a good choice for you. 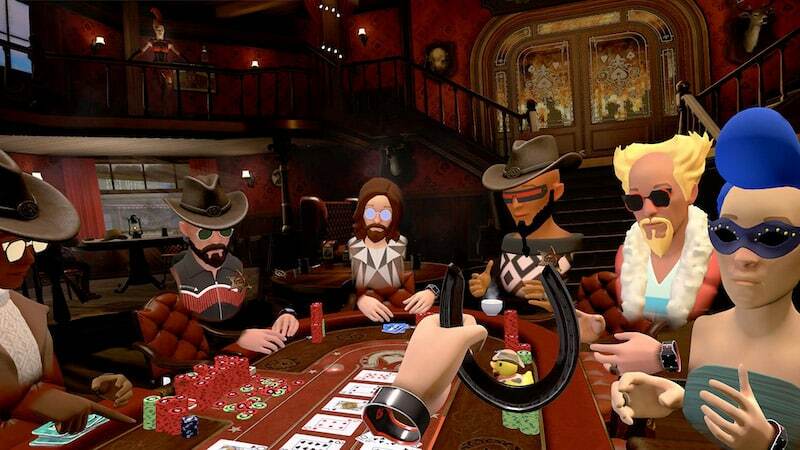 Poker VR is another VR Texas Hold’em game; however, it is available across multiple platforms, including Oculus Go, Oculus Rift, and Samsung GearVR. Oculus Go and Samsung GearVR do not have the external sensors and touch controllers that Oculus Rift and HTC Vive have, thus Poker VR uses a control pad rather than having motion control and realistic object interactions. Poker VR is free to play and provides good poker gameplay. It is capable of live chat, allowing for some social interaction and it boasts pretty realistic avatar face motion to match the movements from you are saying. 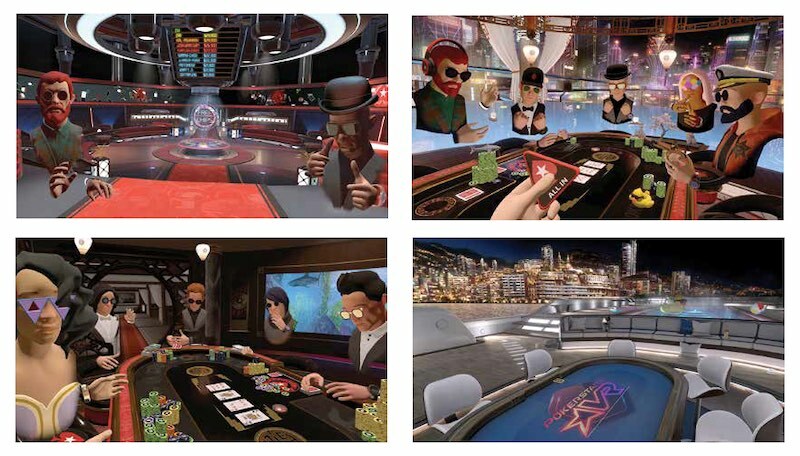 Poker VR is a lower level VR poker game with less impressive graphics and lacks the motion tracking of PokerStars VR. If you have a Samsung GearVR or Oculus Go and don’t have a Rift or HTC Vive, then this may be a good option for you. 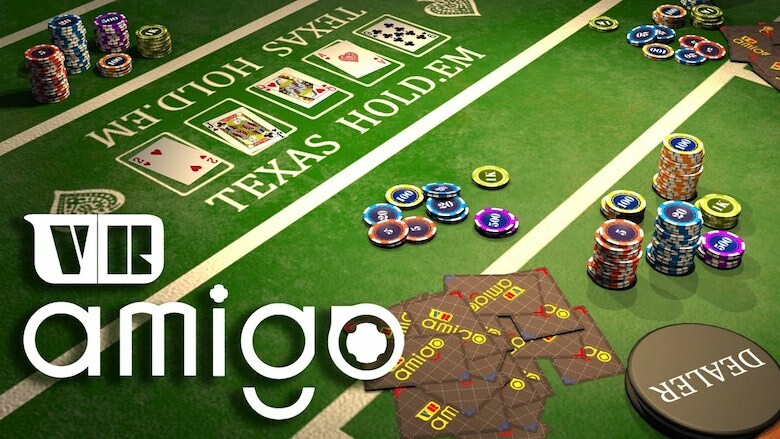 Amigo VR is an online VR casino game which has Texas Hold’em as well as Blackjack. The poker gameplay is standard Texas Hold’em. There are full-bodied avatars, though the rendering leaves something to be desired and it can cause the game to become a little choppy. Amigo is free to play and is available only on HTC Vive. It uses touch controllers but does not have the level of motion tracking that Lucky Night and PokerStars has, thus preventing this from adding to the ability to read the other players. If you have an HTC Vive and want to be able to play Blackjack in addition to Texas Hold’em, then this may be a good choice for you. 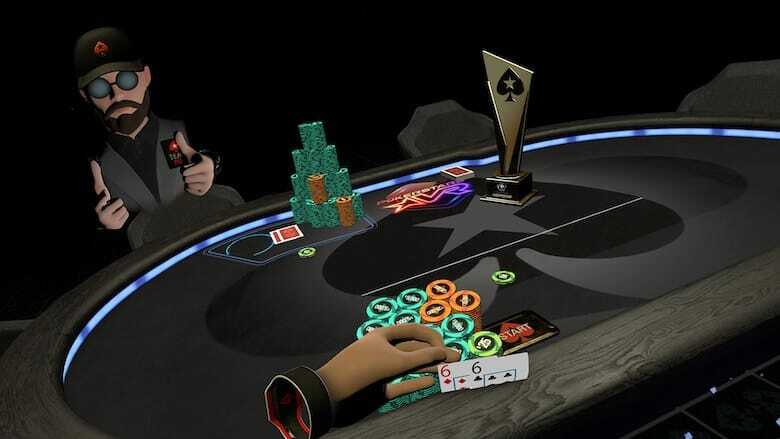 PokerStars VR is a newcomer to the virtual reality poker world, but PokerStars is a long history in the online poker market. Their new VR option is top notch. The motion tracking takes the poker gameplay to a new level. PokerStars VR also stands out with the social aspect of the game. The props, live chat, and virtual interactions with other live players is a unique and fun experience and would no doubt be a particularly great time at a private table with your friends. Click here to download PokerStars VR, today.